Our classic cufflinks department contains a variety of cufflinks suitable for day and evening wear. We have cufflinks with stones, plain cufflinks as well as coloured enamels and classic knots. So whether your taste is purely classic or classic with a modern twist you should be able to find it here. 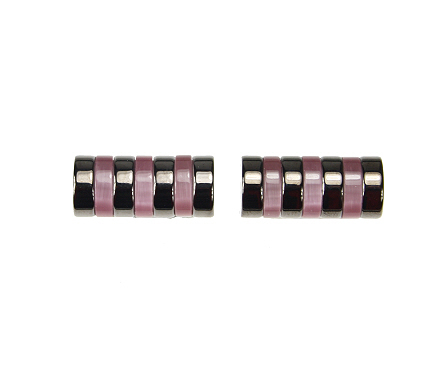 A pair of barrel cufflinks with pale pink and dark gunmental colouring. Boxed. A pair of beautiful octagonal cufflinks with real multi-coloured stone segments on gold coloured fitments. Gift boxed. A pair of rectangular burgundy and gold coloured enamel cufflinks with a wavy textured background. Boxed. A pair of classic black onyx cufflinks with gold edge and cut away corners. T-bar style. Gift boxed. Smart square shaped cufflinks with black onyx and mother of pearl diagonal stripes surrounded by a silver edging. Attractive square shaped cufflinks with paua shell and mother of pearl square patterns surrounded by a gold edging. A timeless pair of black and red enamel cufflinks in a diagonal striped pattern. A classic pair of blue and white enamel cufflinks in a diagonal striped pattern. Neat rectangular cufflinks with a blue vertical striped design on a silver background. A classic pair of oval cornelian stone cufflinks in a beautiful reddish brown shade edged in gold. A stylish pair of purple cufflinks in a ribbed enamel design with horizontal silver bars inbetween. A stunning pair of iridescent blue and white enamel oval cufflinks in a starburst pattern. A fantastic square cufflink with purple, pink and lilac vertical textured stripes in graduated widths. A smart pair of jet black fleur de lis cufflinks with silver fitments. An impressive pair of silver and black cufflinks with a raised scroll pattern.